This is the title of a page of 226 contributors from the Petralia Sottana area (Palermo province, Sicily), who in 1920 contributed money to assist war crippled and orphaned persons. Vincenzio Farinella came to the U.S. when he was 17 years old. He was president of the Society. When Vincenzo died, his son Charlie went through his papers and found this list. 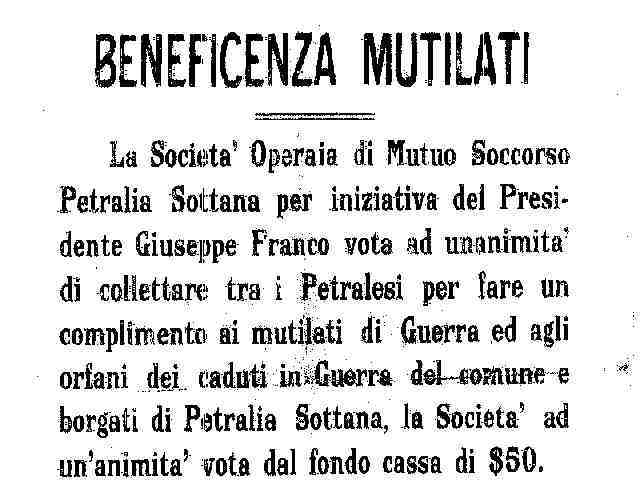 "The Society Worker of Mutual Aid Petralia Sottana through initiative of the President Guiseppe Franco votes unanimously to collect between the Petralesis to compliment the cripples of War and the orphans of the fallen ones in War from the municipality and villages of Petralia Sottana, the Society unanimously devotes from the deep chest of $50."